The month's theme of "Scandal" has brought about many delicious stories of notorious women. I thought it might be interesting to look into how a scandalous woman becomes notorious. Especially in the days before mass media. The Tang Dynasty (618 A.D. - 907 A.D.) was a particularly literate time. Now, by literate that doesn't mean that every peasant and farmer could read and write, but people outside of the highest noble classes studied calligraphy and poetry and read the classics. Empress Wu supported the imperial civil examination system as a way for commoners to elevate themselves in the ranks. You could rise above your station and the way to do it, was through education. Then on top of that, people seemed fascinated with the lives of the imperial family. They were the subjects of painting, sculpture and poetry. Enter Yang Yuhuan. Consort Yang was arguably the most famous concubine in Chinese history--she's credited with bringing down the Golden Age with her beauty. 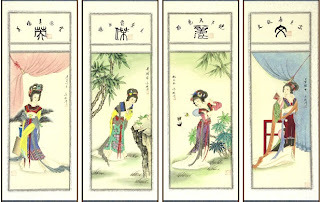 She appears as one of the Four Beauties--a very common theme in Chinese artwork. What draws people to Concubine Yang's story is that it starts as a romance and ends so tragically. Emperor Xuanxong sees her bathing in a pool among other palace beauties and he falls madly in love with her. At that time, he's 61 and she's 26. He installs her in his palace and spends every waking moment by her side. He gives her the title of "Yang Guifei" which means "Precious Consort Yang". The title elevates her to the most highest ranking woman in the court besides the Empress. Then he starts promoting her family members to key positions. hat's where things go wrong. The early part of Emperor Xuanzong reign is considered the height of the Golden Age. The empire is prosperous and wealthy and the arts flourish. At the later part of his reign, strife and rebellion start to brew. The regional warlords, many who are ethically non-Han, start wresting power from the central imperial government. The empire suffers several disastrous military losses to. The Emperor is criticized for leaving the rule of the empire to corrupt eunuchs and officials. His infatuation for Yang Guifei is an easy target. This period of unrest culminates in the Anshi rebellion when warlord An Lushan marches on the imperial capital and the Emperor and his consort or forced to flee. But suddenly, the Emperor's guards will go no further. They refuse to protect him unless he orders the death of the one woman blamed for starting the downfall. The Emperor orders the eunuchs to execute Yang Guifei, the love of his life, then and there, by the side of the road. She's strangled with a horse whip and buried in an unmarked grave. It is said that Emperor Xuanzong mourned for her for the rest of his life. Once the Anshi rebellion was put down, he abdicated the throne. He tried to return to the roadside and find her grave, but when they opened it, there was nothing left. He died heartbroken. Consort Yang became notorious in her time because of the prevalence of poetry and propaganda that publicized her relationship with the Emperor. The story of the Emperor's obsession with her became so well known that she became a scapegoat for political events that were out of her control. Perhaps it was easier to blame a beautiful "femme fatale" than a great Emperor for the downfall of the kingdom. The Tang poet, Bai Juyi (772 - 846 A.D.) immortalized her in "The Song of Everlasting Sorrow". Bai Juyi's poetry as very accessible and immediately popularized the romance and tragedy of Consort Yang and the Emperor. The secondary character of Lady Ling in my forthcoming debut, BUTTERFLY SWORDS, was inspired by the Consort Yang Yuhuan. Perhaps she'll get her own, happier ending one day.